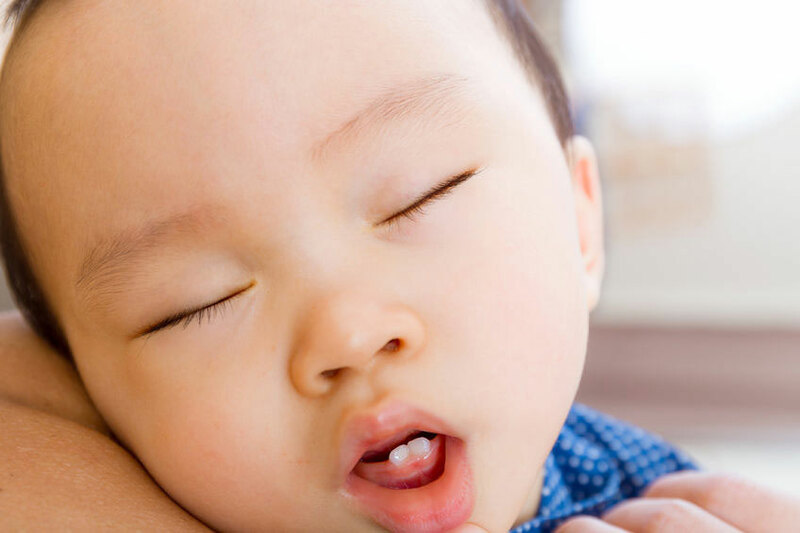 Some dentists blame tooth decay in toddlers on breastfeeding. However breastfeeding a baby with teeth is a normal and natural event including breastfeeding at night. Many toddlers are breastfeeding with lots of teeth the world over and they haven’t all got tooth decay. Our related article Breastfeeding and Tooth Decay looks in more detail at the evidence around whether breastfeeding causes early cavities (holes in teeth) and considers all the other factors that can cause tooth decay. This article looks at recommendations for caring for your baby’s teeth and ideas to avoid or reduce tooth decay when you’re breastfeeding a toddler. There is no evidence that stopping breastfeeding will prevent or stop dental decay. It is much more likely that eating sugary food, poor dental hygiene, and the presence of certain bacteria in the mouth are the causes of dental decay. For a fuller discussion on all the possible causes of early tooth decay see Breastfeeding and Tooth Decay. 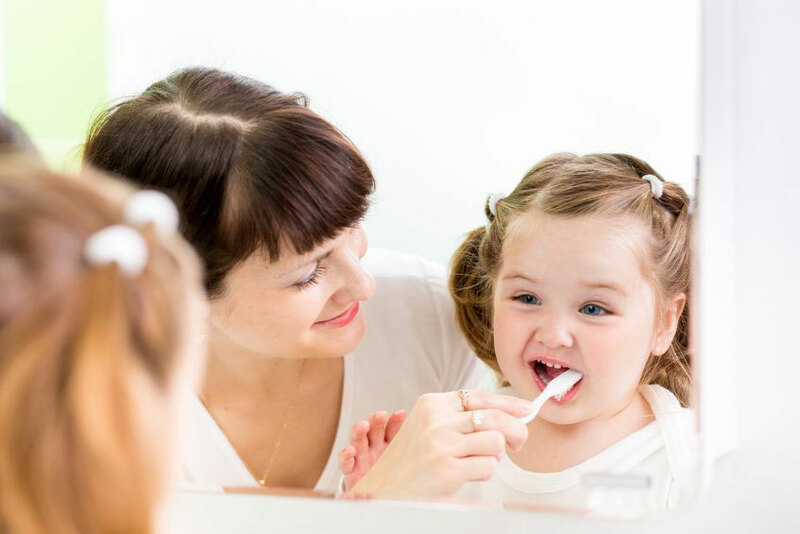 It is important to keep children’s teeth clean to remove traces of food and reduce the levels of Strep mutans (a bacteria that cause cavities) irrespective of breastfeeding. Public Health England have produced a 98 page evidence-based toolkit for better oral health. This includes a section for prevention of tooth decay in children up to six-years-old. The NHS (National Health Service) in the UK has a little video to show you how to brush a baby’s teeth. Check teeth regularly including under the top lip where the teeth meet the gums and visit your dentist for routine check ups. White spots on the upper front teeth or whitish lines at the base of the teeth along the gum line can be signs of early decay which may still be reversible with prompt treatment. White spots can also be associated with too much fluoride exposure (see below). How a tight upper lip frenulum might be associated with tooth decay is mentioned in Lip-Tie and Breastfeeding. A heathy diet will help build strong teeth1. Although fruit and vegetables are healthy—be aware that acidic food and drink (e.g. oranges, fruit juice, fizzy drinks) have the potential to damage tiny teeth by reducing pH (the overall acidity or alkalinity in the mouth) and coating them in sugar. Sipping water after meals may help rinse food and drink from the mouth2 and eating cheese is thought to help prevent cavities by changing the pH of the mouth3. Eating healthily in pregnancy while baby’s teeth are forming is also thought to be helpful4. What about breastfeeding at night? there’s no need to keep your child from nursing at night since human milk by itself actually helps protect against cavities. Avoid passing items mouth-to-mouth between you and your baby to reduce the risk of passing decay causing bacteria from parent to child. Xylitol is a natural carbohydrate sugar substitute in chewing gum and other products that helps stop bacteria sticking to teeth. Reducing the level of bacteria in a mother’s mouth may lower the risk of passing them on to her baby 56. Toothpaste isn’t necessary, but if your toddler enjoys the foamy grins, use a dab of mildly flavored toothpaste. Before using a fluoride containing toothpaste, check with your dentist. If your child is already getting fluoride supplements or drinks a lot of fluoridated water, don’t use fluoridated toothpaste. The American Dental Association8 describes the small smear of toothpaste needed as equivalent to a grain of rice. NHS Choices recommends different strengths of fluoride in toothpaste according to age see Fluoride (NHS, 2015).